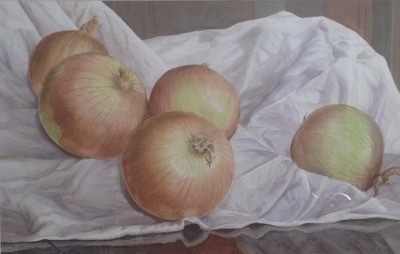 Paul J. Noel ~ 'Still Life With Onions' ~ Watercolor 22" x 30"
PORTLAND, Maine - Feb. 18, 2017 - PRLog -- 'Works on Paper' an annual exhibit at Richard Boyd Art Gallery opens Saturday, April 1 at 10:00 a.m. The exhibit explores works by three artists creating paintings and drawings on a time honored raw product - paper. An unforgiving surface around for centuries, paper reveals the artist's proficiency in creating works of visual art. The exhibit features a selection of original paintings and drawings depicting an array of subjects from dramatic still life, to traditional landscapes and figurative studies by artists' Paul J. Noël - still life and landscape paintings in watercolor and oil, and figurative studies in graphite; Julianne Garvey - landscape paintings in watercolor and mixed media, and Randy Eckard - landscape paintings in watercolor. 'Works on Paper: Paintings and Drawings' is on view free of charge between the hours of 10:00 a.m. and 5:00 p.m. daily through April 29, 2017. The public is invited to meet artists Paul J. Noël and Julianne Garvey at the opening reception, at Richard Boyd Art Gallery, on Saturday, April 1 between the hours of 12:00 noon and 3:00 p.m. Artist Paul J. Noël is a multi-talented artist and retired Interior Designer whose works on paper depict a variety of subjects from still life and landscapes, to portraits and figurative studies. Using mediums around for centuries, graphite and watercolor, Paul's original paintings and drawings are full of detail, from the crisp skins on ordinary onions, to the life lines of individuals in his sketches. A member of the newbury Port Art Association and Copley Society of Boston, Paul says, "I dabbled in art, here and there, but never had the time or motivation that I have now. I can paint with a passion and carefree attitude, with no distractions. I have taken courses along the way including a four month sojourn to paris to immerse myself in painting. I left Paris with a new found spirit and ability which I could never have discovered, in small doses, in Maine. This was the tipping point to my new life as a fine artist." Watercolorist Julianne Garvey moved to Maine in 1980. She studied art at The University of Georgia, her first two years of college, later graduating from The College of William and Mary in Virginia. Julianne's landscape paintings have depth and a level of detail that draws the viewer in for a closer look. Her paintings depicting old textile mills in Lewiston, Maine pay homage to the town's historic textile industry. Julie says, "Since graduating family life and work have taken the majority of my time, but never dampened my enthusiasm for expressing myself through many different mediums, with my first love being watercolors. I'm not sure if any artist knows why we create art, beyond the simpl fact that we do. Of course living in Maine, being surrounded by the constant beauty that abounds here is my never-ending inspiration. I do know that I love creating art and just wouldn't fell complete if I were not to do so." A commercial and fine artist, watercolorist Randy Eckard's painting are exquistely rendered and full of detail. Eckard studied art at the Ringling School of Art in Sarasota, Florida and the Haywood School of Craft in Clyde, North Carolina and has received over 190 awards for his paintings in watercolor. Randy says, "My approach to watercolor painting is nontraditional, in that I try to avoid the limitations and trappings of traditional watercolor techniques. Although traditional washes are an integral part of the painting process, I rely more on the layering of color with glazing and dry brush work. Moving between wet and dry on the same piece of paper achieves a variety of complimenatry surfaces, which allows for the luminous quality of watercolor with added depth of color and texture." Richard Boyd Art Gallery is located on Peaks Island at the corner of Island Avenue and Epps Street, in the first building on the right, on the first floor. The gallery exhibits original works of visual art created by artists with a connection to the state of Maine. During the months of April through October the gallery is open between the hours of 10:00 a.m. and 5:00 p.m. daily. From November through the end of March the gallery is open between the hours of 10:00 a.m. and 3:00 p.m. every Friday, Saturday and Sunday. Additional days and times can be scheduled by appointment. For more information about the reception or exhibit please contact the gallery by phone at 207-712-1097, via email at info@richardboydartgallery.com or visit http://www.richardboydartgallery.com . Like the gallery on Facebook at http://www.facebook.com/RichardBoydArtGallery . Copyright©2017 Richard Boyd Art Gallery All Rights Reserved.